Price was expected to move higher, but sideways movement suggests a triangle is forming for the short term. 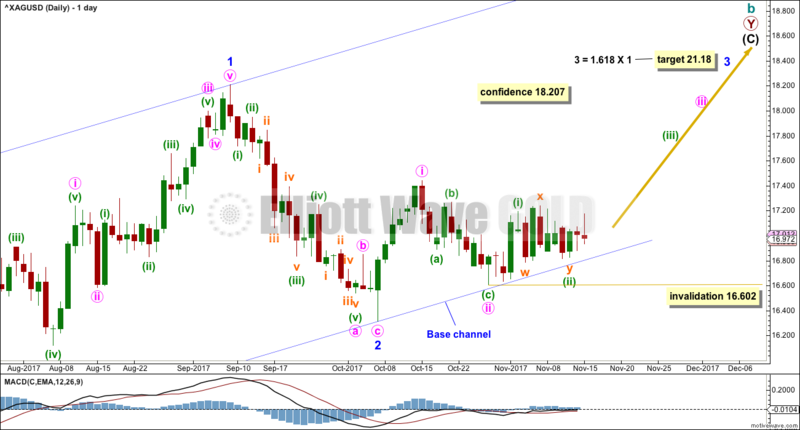 Two Elliott wave triangle counts are considered, and the classic symmetrical triangle is examined in this analysis. Summary: A triangle may be either complete or complete very soon. Watch for the breakout; it may come within a few days. 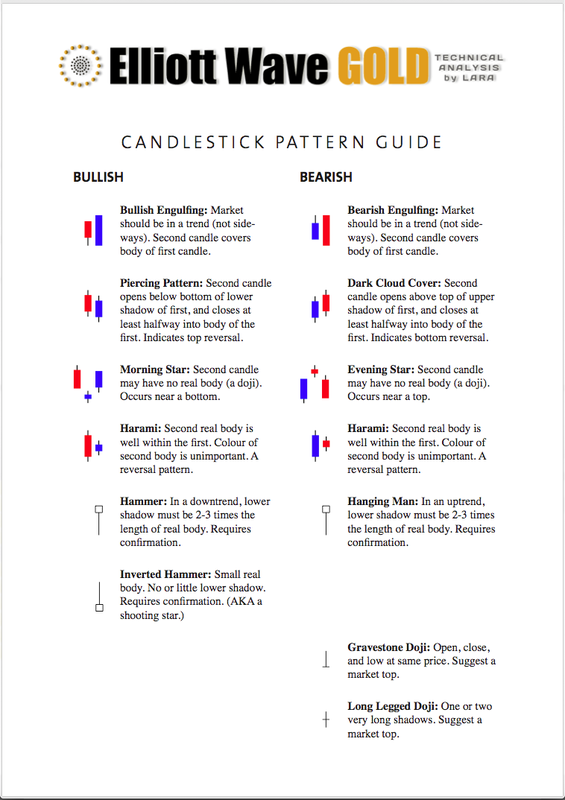 Some trading guidance for triangles is given from Dhalquist and Kirkpatrick in the classic technical analysis section. Within a flat correction, intermediate wave (B) must retrace a minimum 0.9 length of intermediate wave (A) at 15.938. 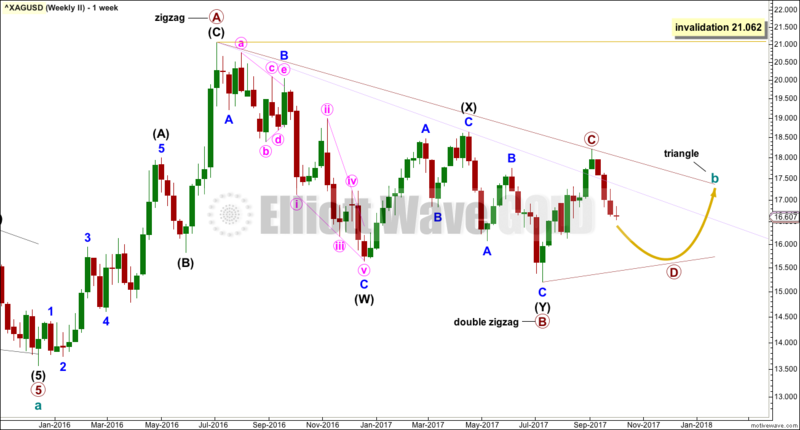 Intermediate wave (B) has met this minimum requirement; the rule for a flat correction is met. Intermediate wave (B) is longer than 1.05 times the length of intermediate wave (A) indicating this may be an expanded flat. Expanded flat corrections are the most common type. Normally their C waves are 1.618 or 2.618 the length of their A waves. The target calculated would see primary wave Y to end close to same level as primary wave W about 21.062. The purpose of combinations is to take up time and move price sideways. To achieve this purpose the second structure in the double normally ends about the same level as the first. For this first wave count, upwards movement for intermediate wave (C) must subdivide as a five wave structure. It may be unfolding as an impulse. Within the impulse of intermediate wave (C), only minor wave 1 was over at the last high and now minor wave 2 may now be complete. Minor wave 2 may have ended very close to the most likely point of the 0.618 Fibonacci ratio of minor wave 1 at 16.347. Minor wave 1 lasted 44 days. Minor wave 2 may have completed in 20 days, just one short of a Fibonacci 21. Minor wave 3 may only subdivide as an impulse. It would be very likely to show its subdivisions clearly at the daily chart level. Minute waves ii and iv within it should show up as multi day pullbacks or sideways consolidations. 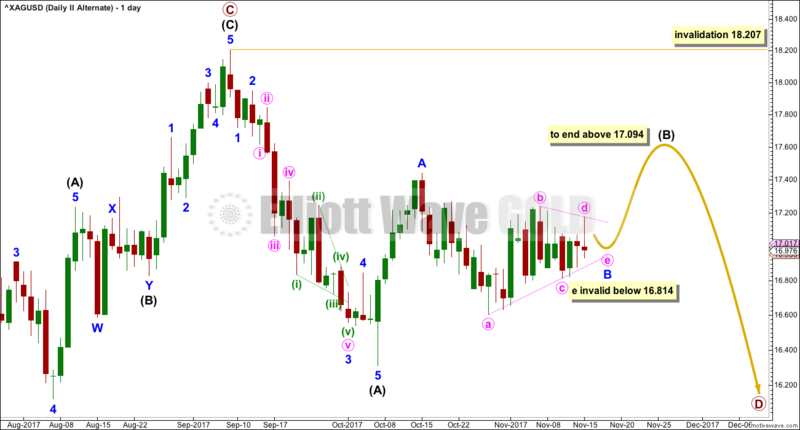 Minute wave ii now shows up at the weekly and daily chart levels. 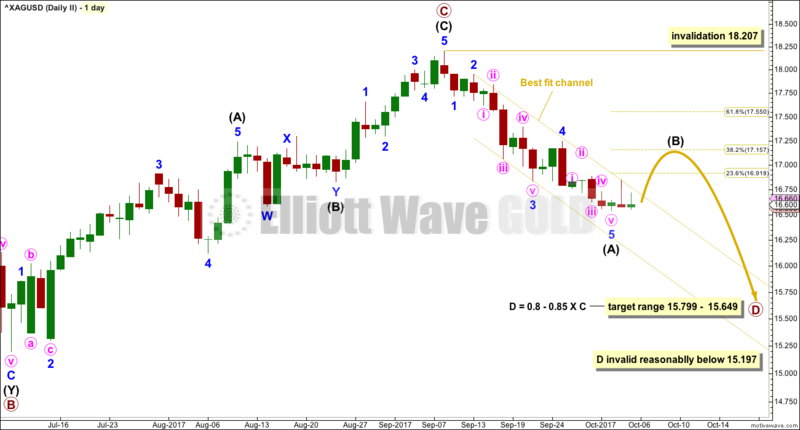 Within minute wave iii, no second wave correction may move beyond its start below 16.602. A base channel is added to minor waves 1 and 2. Downwards movement is finding very strong support at the lower edge of this base channel. If price breaks below the base channel, then the probability of this wave count would substantially reduce prior to invalidation. This wave count now expects to see a strong increase in upwards momentum as a third wave up at three degrees unfolds. The fact that strong upwards movement has failed so far to materialise must reduce the probability now of this wave count. 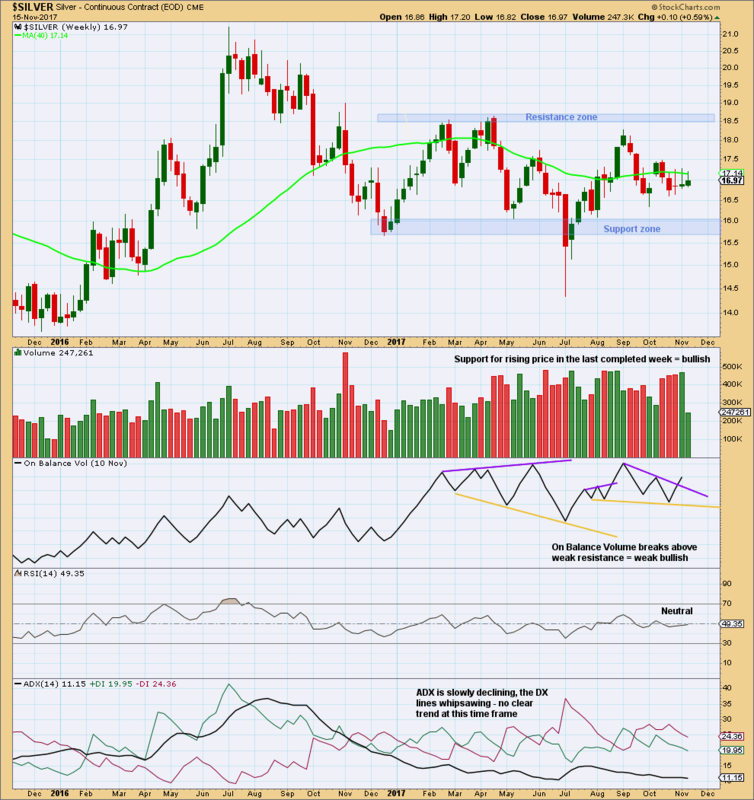 It remains possible for Silver that a large regular contracting or regular barrier triangle may be completing. Within a triangle, one of the sub-waves must be a more complicated multiple, usually a multiple zigzag. This may be complete for primary wave B. Primary wave C upwards may now be complete. The upper A-C trend line does have a fairly steep slope though, so it must be accepted that primary wave C may not be over and may continue higher. If it does, it may not move beyond the end of primary wave A above 21.062. 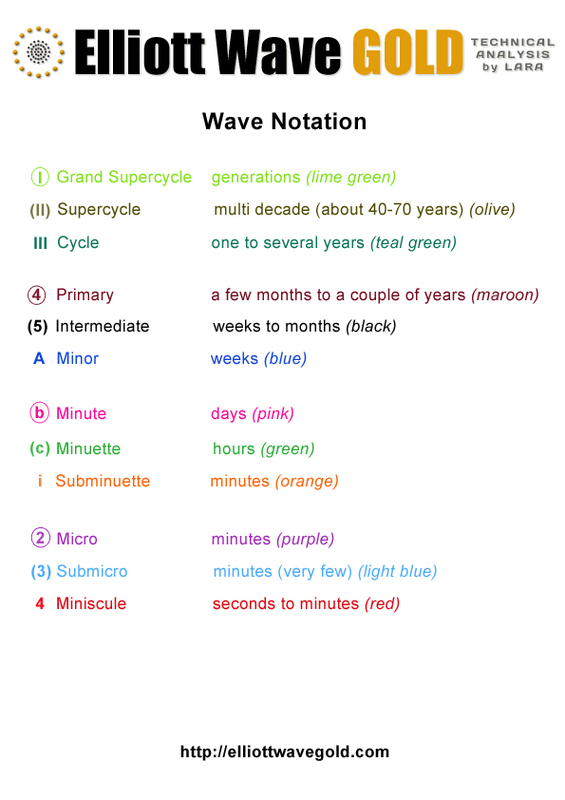 Primary wave C must subdivide as a three wave zigzag. 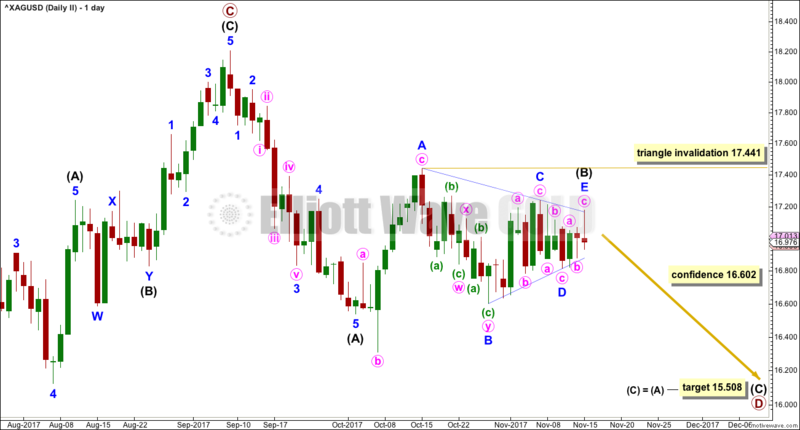 This triangle wave count now expects that primary wave D downwards may now be underway. Two scenarios for how it subdivides are presented below at the daily chart level. Primary wave D of a contracting triangle may not move beyond the end of primary wave B below 15.197. Primary wave D of a barrier triangle may end about the same level as primary wave B at 15.197; as long as the B-D trend line is essentially flat, the triangle will remain valid. Unfortunately, there is some subjectivity in this rule; it is not black and white. Primary wave D must subdivide as a zigzag. 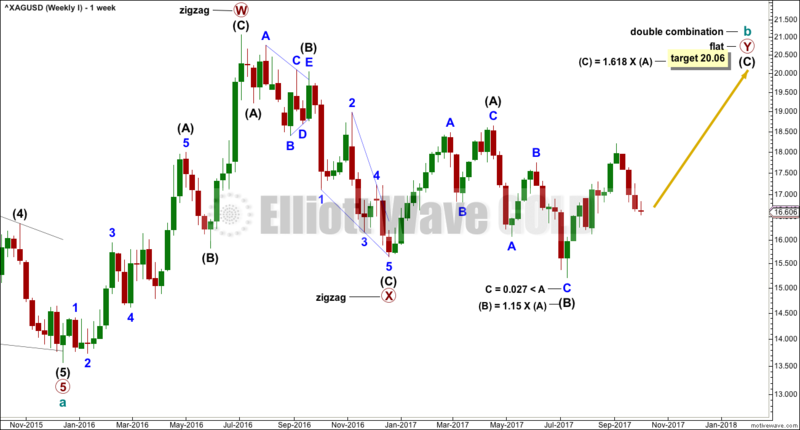 Within the zigzag, intermediate wave (B) may be any corrective structure. At this stage, it may be a complete regular contracting triangle. Minor wave E slightly overshoots the A-C trend line. Sometimes triangles end with a small overshoot. 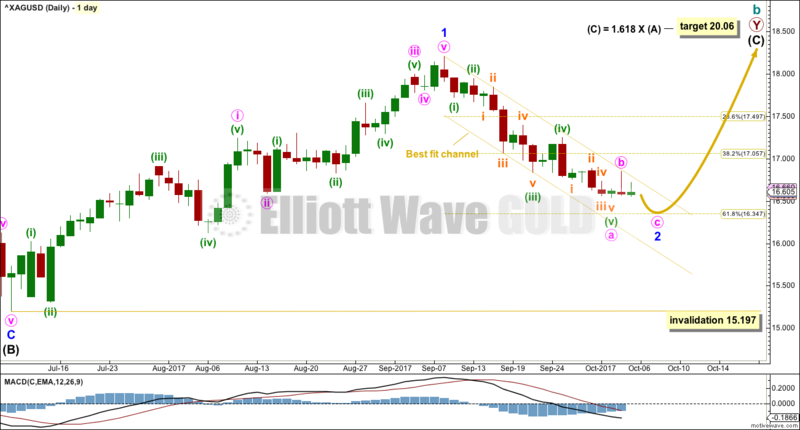 If price begins to move strongly lower and makes a new low below 16.602, then confidence may be had in this wave count. The target for primary wave D expects to see the most common Fibonacci ratio between intermediate waves (A) and (C). When an Elliott wave triangle is considered, it is vital to always consider alternate ways to label the triangle. The triangle may be minor wave B within intermediate wave (B). The breakout may be upwards. Within the triangle, minute wave e may not move beyond the end of minute wave c. A new low below 16.814 would invalidate this triangle idea and add some confidence to the main wave count above. Within the zigzag of intermediate wave (B), minor wave C would be very likely to make at least a slight new high above the end of minor wave A at 17.094 to avoid a truncation. The strongest week during this large consolidation is a downwards week ending 12th of June. However, this is stronger by only a small margin. The next strongest week is an upwards week. It may be better to look at daily volume bars to determine the most likely direction of a breakout from this consolidation. The last two completed weeks moved price higher with an increase in volume. This is bullish. 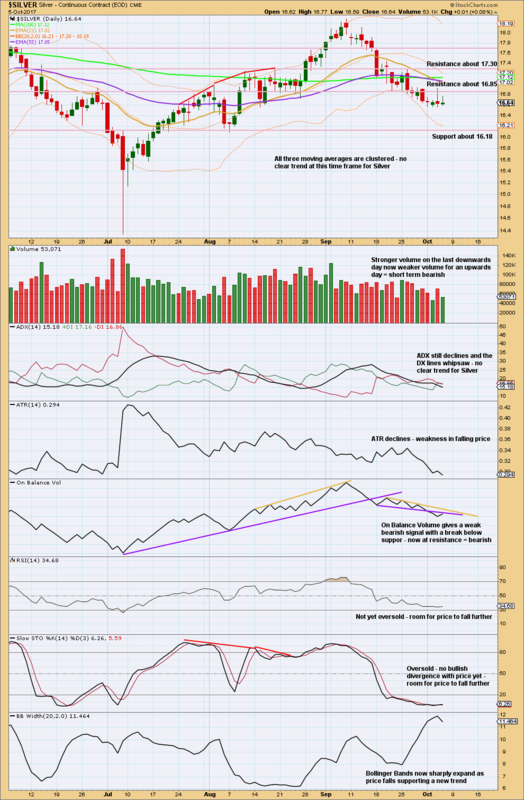 Another weak bullish signal comes this week from On Balance Volume. 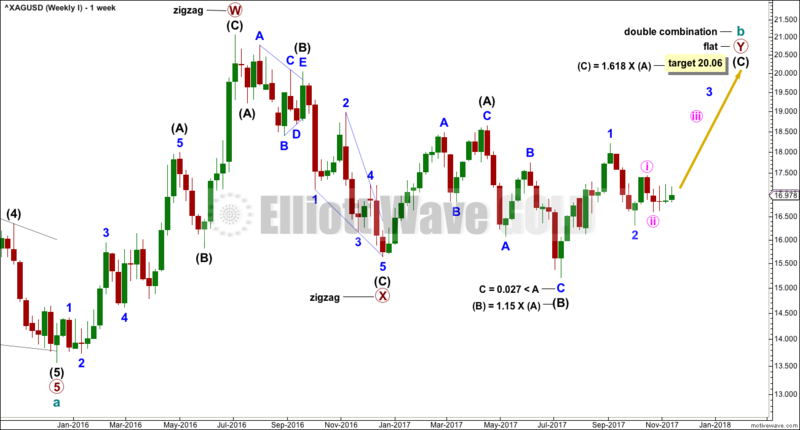 This chart supports the first and second alternate Elliott wave counts. Volume suggests an upwards breakout from the symmetrical triangle. The last day though is very bearish. The long upper wick is bearish as is volume. “The ideal situation for trading triangles is a definite breakout, a high trading range within the triangle, an upward-sloping volume trend during the formation of the triangle, and especially a gap on the breakout. For the example in the chart above, a breakout is required either above (54% likely) or below the trend lines. It should come soon now as price is close to about 75% the length of the triangle. It will be there in about two more days. A gap on the breakout would increase performance. Volume supporting movement would also provide confidence. Stops may be set just above or below the triangle trend lines; below if an upwards breakout or above if a downwards breakout occurs. A position should be entered on the breakout, but do not wait for a throwback or pullback as it may not come. Published @ 01:11 a.m. EST. More downwards movement was expected after last week’s analysis. Silver has made a new low, which fits expectations so far. With this market in a large consolidation, volume analysis will be used to indicate the breakout direction. Summary: Downwards movement has support from classic technical analysis. The target is at either 16.347 or as low as 15.799 – 15.649. 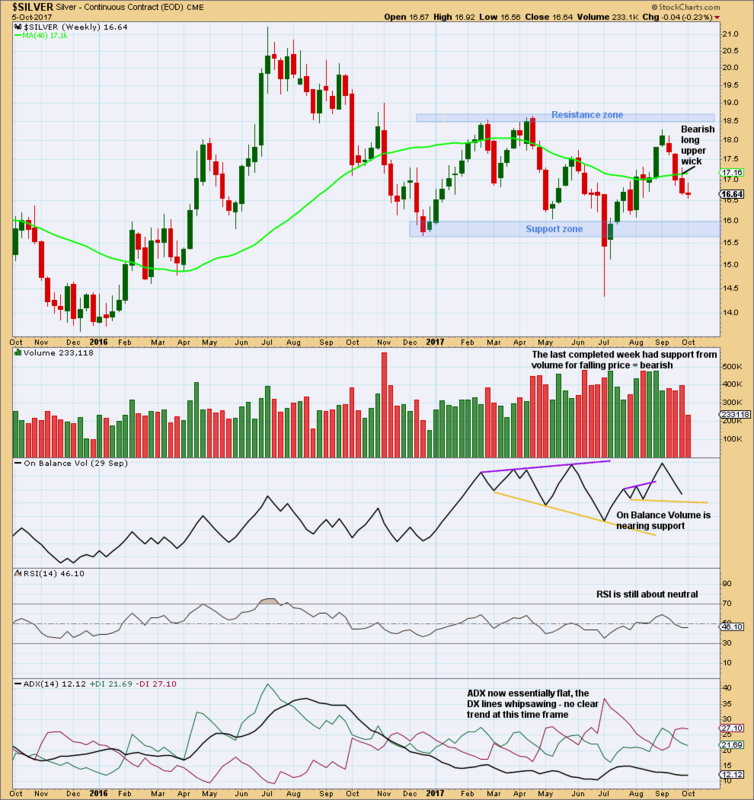 It is possible that a bounce may unfold about here for Silver, but the low does not look to be in place yet. Within the impulse of intermediate wave (C), only minor wave 1 was over at the last high and now minor wave 2 may be unfolding. Minor wave 2 may not move beyond the start of minor wave 1 below 15.197. The most likely point for minor wave 2 to end may be the 0.618 Fibonacci ratio of minor wave 1 at 16.347. Minor wave 1 lasted 44 days. Minor wave 2 so far has lasted 19 days. It would be likely to continue further, so that it has better proportion to minor wave 1. A Fibonacci 21 or 34 days may be expected at this stage. Primary wave C now looks complete and primary wave D downwards looks to have begun for this wave count. Primary wave D downwards must subdivide as a zigzag, which subdivides 5-3-5. Within primary wave D, intermediate wave (A) now looks like a complete impulse. Intermediate wave (B) may now bounce higher up to the 0.382 or 0.618 Fibonacci ratios of intermediate wave (A). It would be extremely unlikely for this wave count that intermediate wave (B) is over already. It should last at least two weeks and quite likely longer, so that it has reasonable proportion to intermediate wave (A). Intermediate wave (B) should break out above the channel that contained intermediate wave (A). 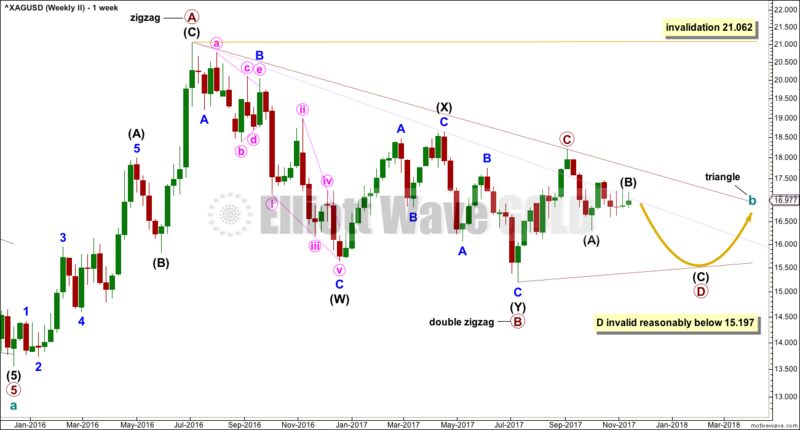 Intermediate wave (B) may not move beyond the start of intermediate wave (A) above 18.207. Price is still within a large consolidation zone. Volume remains relatively strong. So far, within the consolidation, it is only now one downwards week that has strongest volume suggesting a downwards breakout eventually is more likely than upwards. However, the difference is very slight between this week and the next strongest week which was an upwards week, so the signal is not a clear one. Support is some distance away. There is room for price to fall further here. The bearishness of the long upper wick on the last completed weekly candlestick may now be resolved by this current week making a new low. 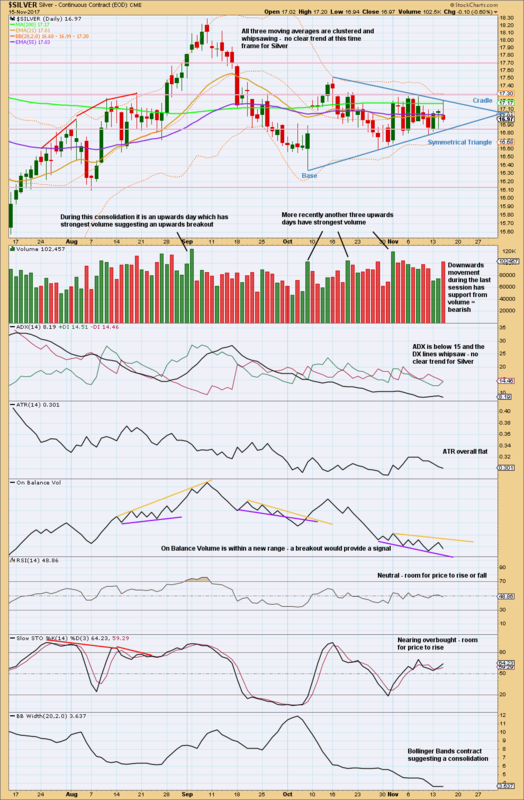 How this current candlestick closes may offer a clue as to how next week may unfold. At the daily chart level, during the most recent consolidation which began back in July, it is an upwards day of the 5th of September that has strongest volume suggesting an upwards breakout is more likely than downwards. The volume profile is bearish for the very short term, but overall as price falls volume is declining. The low does not look to be in place yet, but it may be near. For the short term, On Balance Volume is also bearish. Published @ 10:52 p.m. EST. Again, price remained within the channel on the first daily chart. There is as yet no confirmation of a trend change.